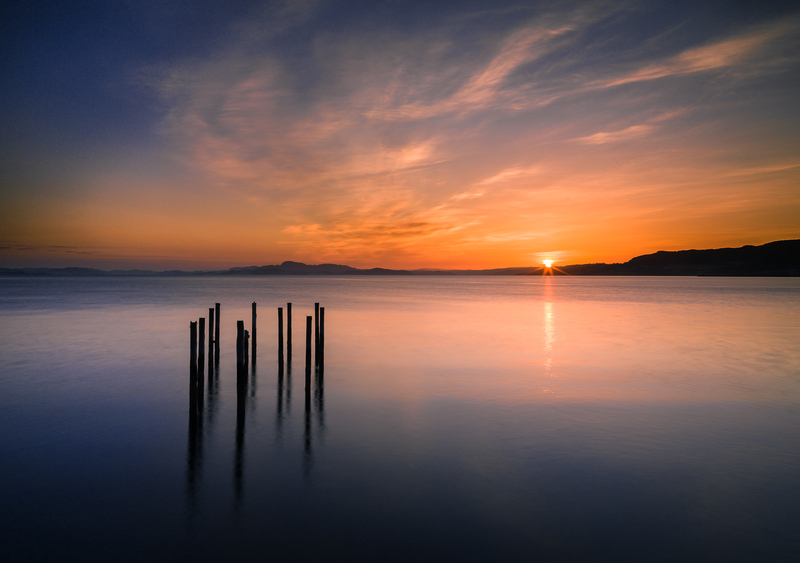 Sunset from Flakstadøy (Nappstraumen). 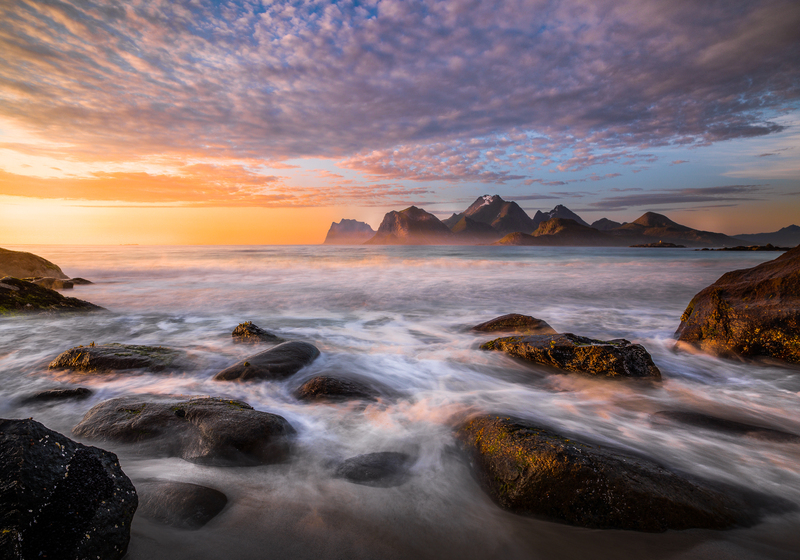 Looking north, you can see the iconic profile of the mountains near Utakleiv and Haukland beach in the distance. Some of you may know that I was born and raised in the northern parts of Norway. Although I have relocated and currently live a little bit to the south, in Trondheim, I often visit “home” up north. Every time I visit, I plan for some landscape photography. North-Norway has a very dramatic landscape, fabulous light and very unpredictable weather. All essential elements of a good landscape-image. I spent one week in North-Norway this summer, and planned a road-trip to the Lofoten island well ahead. An old friend of mine and I were to take the ferry from the mainland (Skutvik) and over to the biggest city in Lofoten, Svolvær. Weather has been extremely wet and grey this summer, but as we sat in out car on the way to the ferry, skies started to clear. We had planned 2 days and nights of intensive shooting, mostly without sleep. We arrived in Svolvær late in the afternoon. 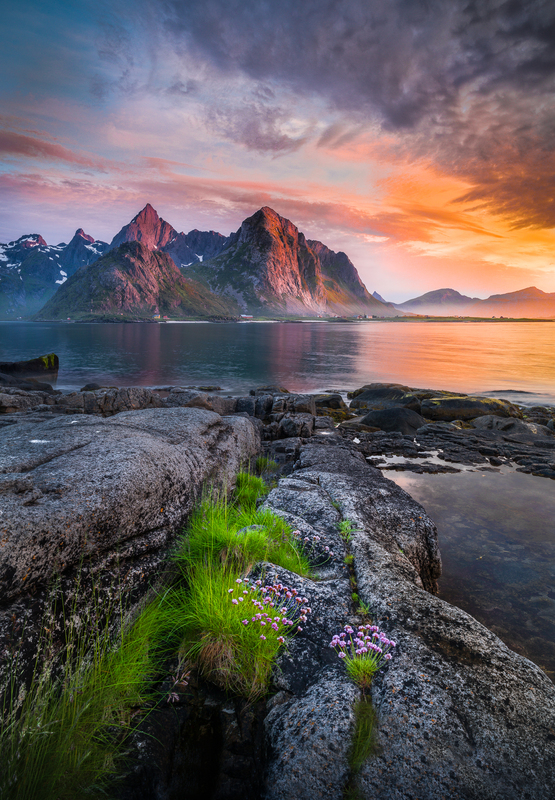 The most photographed areas in Lofoten lies in the southern parts, where the mountains are most spectacular. This time we decided to head north from Svolvær and cover the island of Austvågøy the first night. Although the landscape is a little less dramatic here, It is still spectacular by most standards. And it is less covered by other photographers! We were mostly alone on the road this first night. We drove all around Austvåg and had a great time with a beautiful misty sunset and sunrise just a couple of hours later. After less that two hours sleep and a huuuuge breakfast we drove south to Vestvågøy, Flakstadøy and Moskenesøy. We had clear skies and the bright sunlight didn’t give us anything photographically, so we spent the day scouting for locations, eating and relaxing. When the loooong golden hour set in at around 7-8 in the evening we had found some great places and spent a few hours there. Coffee and redbull kept us going. Some skies emerged and promised for a beautiful sunset. We photographed the most iconic locations (Unstadvik, Utakleiv, Flakstad, Reine etc.) and a few lesser know all through the night. As morning arrived we were pretty much exhausted. As we waited for the mornings first ferry from Moskenes to Bodø, skies were all overcast and the magic was gone. Luckily enough we seemed to have hit the two only days in July with nice weather. Here are a few of the results from the trip. Visit my gallery on nordhaugphotography.com for more Lofoten images. The sun was setting, close to midnight, when we arrived in this location just north of Flakstad. A couple of hours later, the sun emerged from the ocean again and colored the landscape and the mist in a wonderful, warm hue. When I started to photograph, it was rather dark but the disappearing aurora of the sun lit up the scene in a wonderful red-pinkish hue. As it got darker and darker, the aurora weakened and stars started to appear. At the same time, the foreground was becoming very very dark (I could hardly see my hands..), and the moon very bright compared to the landscape. I knew that even the very high dynamic range sensor in my d800 would not be able to capture both landscape, moon, stars and the color of the disappearing sun in one single exposure. So, I composed this image with the camera on my tripod and took numerous exposures at different iso’s and exposure times to capture all the elements in the scene as I saw it. The next day, I sat down and inspected all the different files. The aurora and the moon matched perfectly in some of the exposures, and to my surprise, earthshine lit up the shadowed part of the moon perfectly. The foreground however, was too dark on these exposures and the sky too bright to show any stars. My original plan was to follow my regular HDR workflow and blend the exposures in HDR efex pro but the result was far from satisfying. It lacked the contrast and crispness I wanted. I tried to increase clarity and contrast but by then things started to look really weird. Since I had three exposures from three different regions of the scene I decided to blend them manually. I used the image where the moon and the sunglow was perfect as my base. I then took one exposure of the starry sky and blended it into the top of the first image using the masking bug in the layers module of the wonderful OnOne Perfect Photo Suite 9. In exactly the same manner, I blended a lighter foreground exposure into the lower part of the image. 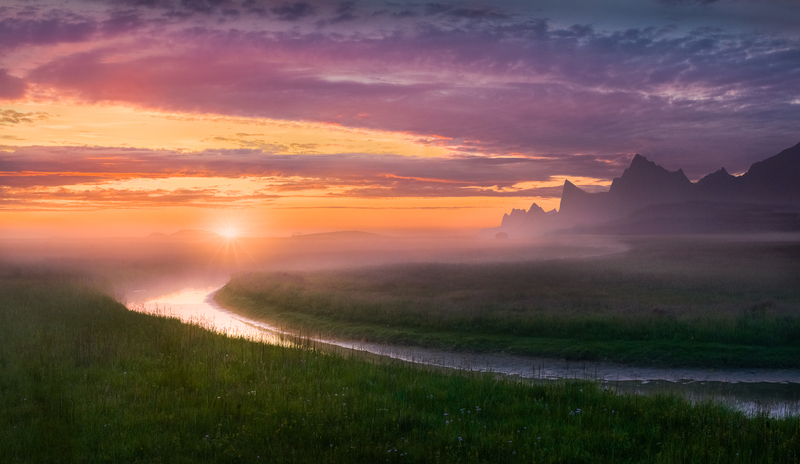 The resulting image was then imported back into Lightroom and after slight adjustment of temperature, color, clarity and sharpness, the image came out very close to how I experienced the scene. The masking bug has a gradient which give soft and natural transitions and I found it amazing how naturally the different exposures blended with a broad gradient. Hope you like my image, have a splendid weekend! 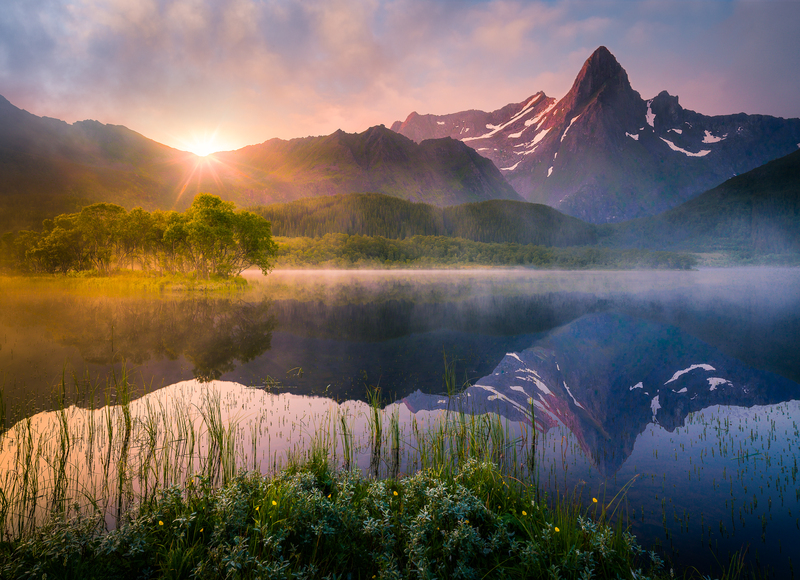 I have visited the Lofoten islands in North Norway on several occasions, both summer and winter, for photography. Being born and raised, and lived a substantial part of my life in North Norway, I am fairly familiar with the landscape and pretty much know what to expect. However, in this part of the world, the weather is extremely unpredictable, so basically you don’t know what you get until after you have been there. Forecasts are nothing but weak guidelines at best. On my last winter-visit a couple of years ago I had snowstorm, rain, freezing could, and bright sunshine, all in one day! So, I pretty much don’t know what to expect from my next trip in february, but I hope for the best. I would of course hope for some clear skies to catch some nightscapes with stars and some aurora-shots, but you’ll never know. Anyway, the landscape itself is so amazing with wonderful mountains raising more or less straight from the sea, so I feel pretty confident that I will be back with at least a few keepers. In the meantime I’m posting this classic scene from the small fishing village of Reine in Lofoten, captured only a couple of hours before midnight in june 2013. Hope you like it! As much as I love a day on the beach, I must admit that few things can compare to a photo-session in a freezing cold, snow-clad landscape. I’m fortunate enough to live in Norway so winter is all around me this time of year. Days are short, but when the skies are clear, the light is beautiful. This image was captured in late december near Mayavatn in central Norway. I was driving home from a visit to friends and family up north as I passed this scene. I stopped the car, parked and ran out in the snowy fields, having snow up to my waist. The thermometer showed -24 deg celsius and I was dressed for driving in a warm comfortable car, not fieldwork. Suffice to say, I got cold and wet, but I think it was worth it. Hope you like my image, have a super Wednesday!